Well, that was a VERY long couple of days. Yes, for the past couple of day I have shut myself in my flat and worked pretty much solidly on designing and developing my final project for the excellent Adobe Generation Games Design course (which you really, really ought to sign up to next year if you’re into computer games). 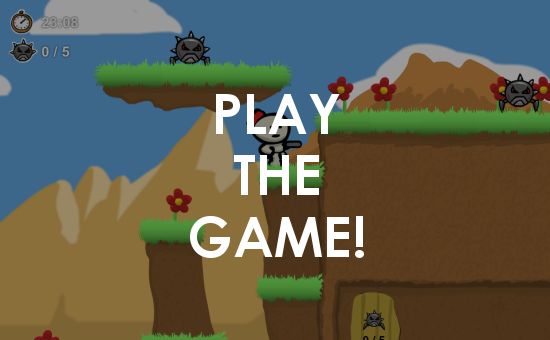 The result – aside from a slightly paler complexion and a desperate need to stop staring at a laptop screen – is a simple, 3 level platform game based loosely on the “RoboCat” game we’d been working on during the course. A simple mechanic and gradual increase in difficulty across levels allows the player to get to grips with the game mechanics before things get more difficult; platform sizes decrease in line with a baddy increase as the player progresses through levels. Time rankings on each level provides the player with a secondary challenge: beat their best time, and get a gold time medal! The character responds quickly and simply to the player’s commands, and the simple mechanic allows for a simple “pick up and play” approach to the game. The player is immersed in the game through the depth created through parallax scrolling, movable platforms and baddies, and sound effects. The player can choose the pace at which they view the introduction, thus preventing them having to sit through long introduction timings each time – they can skip through or watch if they want. Once any level is complete, the player can come back to it to improve on their previous best time – and to get the “Gold” ranking for each. Best times / rankings are remembered between sessions (using Flash’s SharedObject storage) to further aid replayability. Finally, I wanted to expand upon what I’d been taught in the course, so researched and experimented with things such as moving baddies, parallax scrolled environments and long-term storing of scores. I think it’s all worked pretty well in the end! I’ve plenty of things I want to do that I didn’t get a chance to – such as some graphical glitch fixes and better graphics in general (particularly with the Forest level), more baddy / platform types and a huge number of additional levels – and I might well get around to that if there’s demand for it! But given the time available and the fact it’s my first ever platform game (since the single screen pixelly awesomeness of QBasic-based Squage 2 in 1995) I’m pretty pleased with the result! Excitingly, the first prize is a PS3 and £500 of Adobe Cloud membership… I’m really, really hoping they really, really like what I’ve done!